I guess it was meant to be. 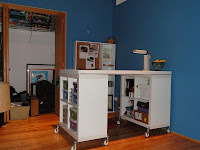 Bob and I spent the holidays listing out our intended 2014 house projects to determine what we would be tackling first. I pushed for the second bathroom, while he had his sights set on a new kitchen sink (and the new kitchen to go with it!). Then, fate intervened when our washing machine decided to make like a broken top and forget how to spin. Ahh, nothin' like a good "top" joke! We thought it was a fluke when we found one load of laundry soaking wet at the end of the wash cycle, but quickly realized that the clothes weren't spinning, instead just sitting in soapy water for 20 minutes until the draining mechanism kicked in. So, I made like a Pioneer Woman and wrung out our duds in the bathtub until they were somewhat ready for the dryer. The next day we started trolling the web for a new Washer and Dryer set. We have a subscription to Consumer Reports which helped us sift through the hundreds of makes, models and modes of W/Ds out there. We knew three things: a) we wanted stackable; b) we wanted front loaders and c) we wanted quiet. We eventually landed on the Whirpool Duet as a cost effective and attractive option. 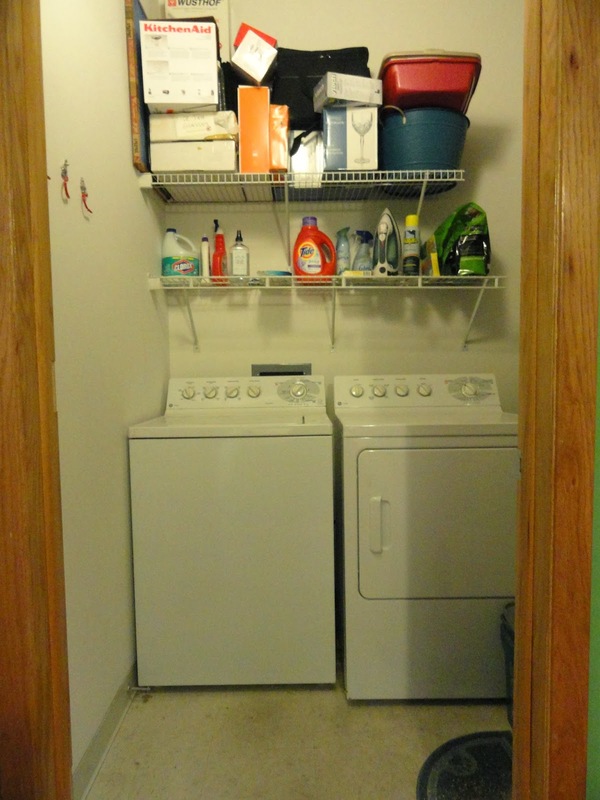 First, some background on our laundry room. We count ourselves very lucky that in a city condo we have more than just a closet that holds the machines with no room for anything else. We are instead blessed with a couple rows of wire shelving and room for our cats' litter box, in addition to our water heater and utilities. But here's the thing. The door opens to the inside which instantly loses us some space along the wall. This makes loading the washing machine or grabbing the ironing board from behind the door difficult. Knowing that we wanted front loaders, the door had to say goodbye. 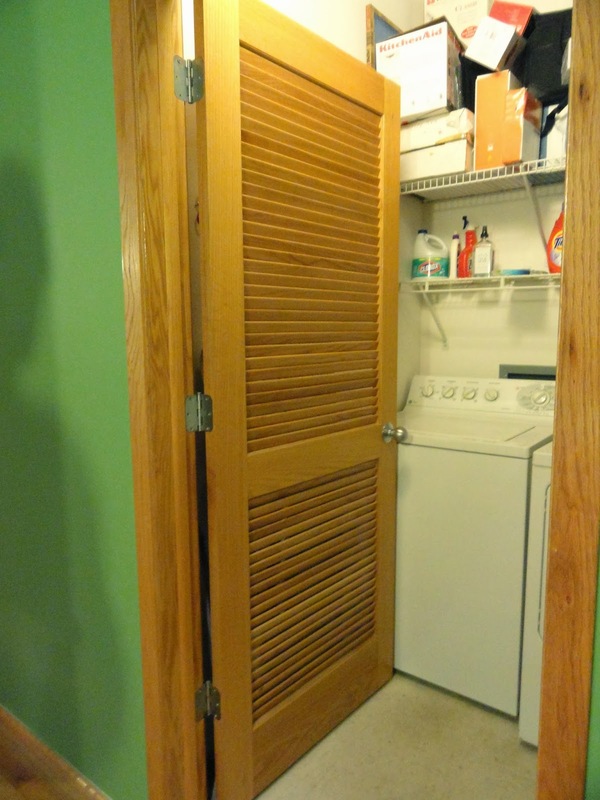 At a 90 degree angle, the open washer door would interfere with the door to the room, plus we wanted to make sure we used all of the available space to our advantage. So we removed the door, with eventual plans to put in a pocket door. Let this serve as our "before shot." 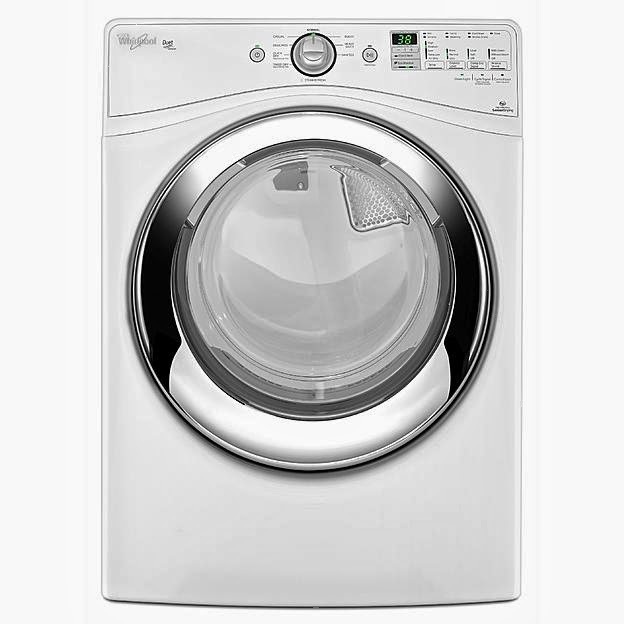 I placed an order for the washing machine through Sears.com, making sure to go through the ShopDiscover link on our Discover card website so we can get additional cashback on the purchase. We marked it for pick up at the nearest Sears, not wanting to spring for delivery or installation charges. 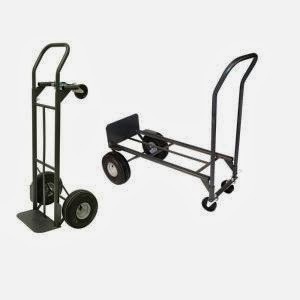 This also gave us the excuse to run to Home Depot and buy a hand cart that will surely be used for years to come for house projects and moves! We hemmed and hawed a bit longer when it came to the dryer. We have a gas hook-up, which already was a bit more expensive an option. Somehow we stumbled onto the Sears Outlet website and found a few good options. The site let us "name our own price" so we trial and error'd this until the site accepted our offer. We ended up saving at least $600 going this route. The only caveats? The purchase was a floor model with a small scratch at the bottom and we had to drive out to Naperville to pick it up. Ahh well, it gave us the excuse to make a day of it out in the 'burbs. Oh, yes, one more catch. 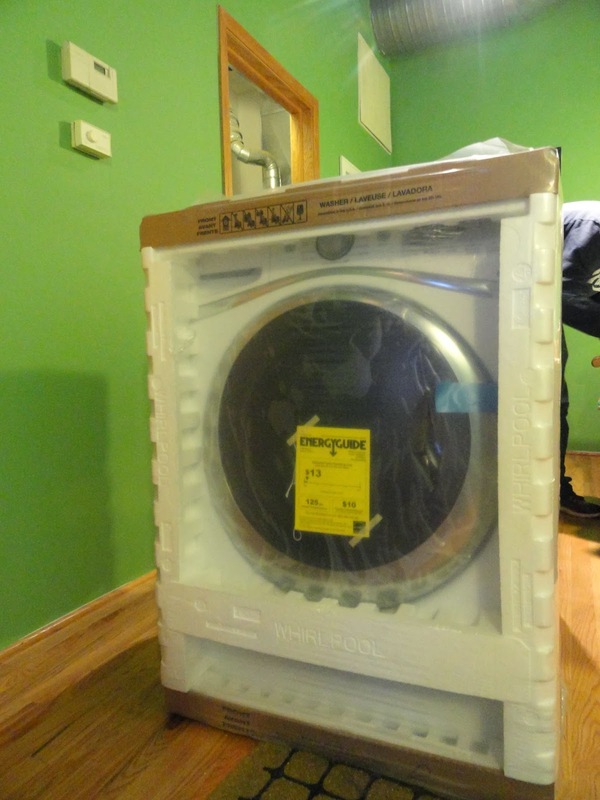 We ended up buying a different model dryer because of this deal. Those model numbers are sneaky like that! 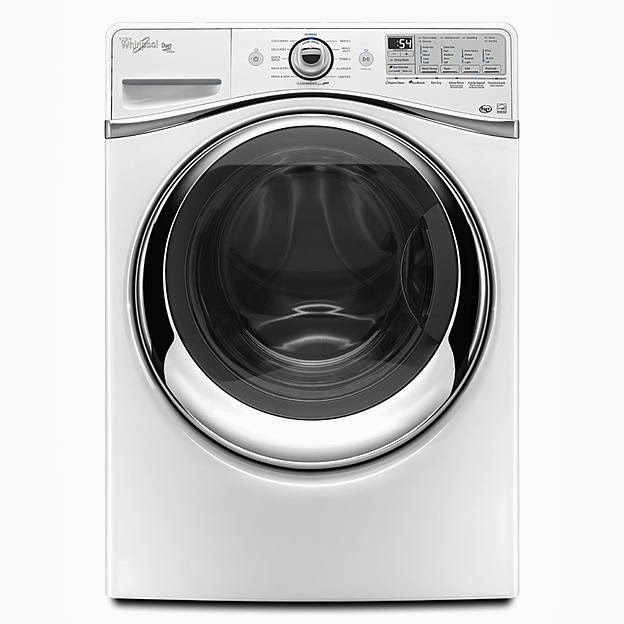 The main difference ends up being that the dryer has a white swoosh across the top and the washer has a silver swoosh. Both models do have chrome rimmed drums, so the differences are truly minor to us. The dryer sat in our hallway for a couple weeks until we had an installer come out to help us. Although in the end turning off the gas line was literally a flick of the switch, I was concerned about us trying to do this ourselves and blowing up the building. We maximized the technician's visit by having him clean our dryer vents. Which is a job I am sure a lot of people skip, but if you read any home maintenance sites you will be scared to death of the fire hazard these lint traps pose! 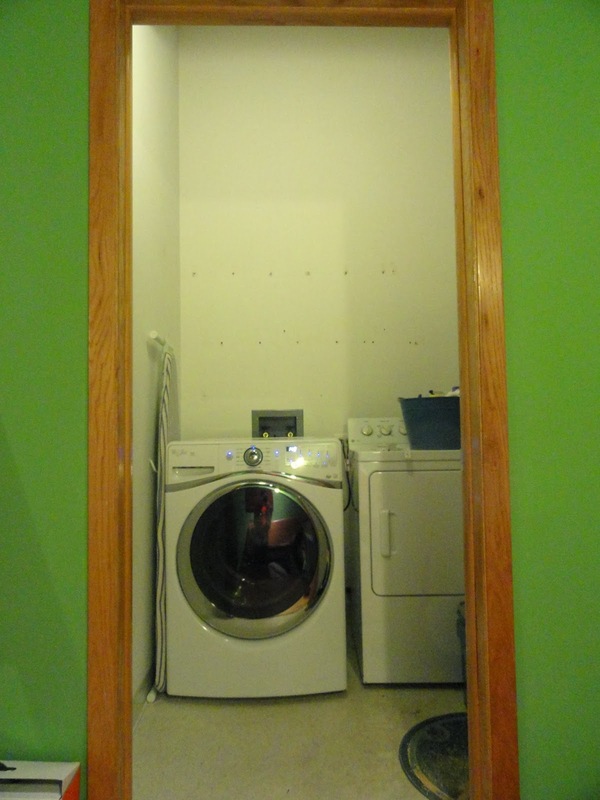 But more on the dryer install in the next post. . . So while the dryer sat waiting to be installed, we knew we needed this washer in place, like, the second we had it in hand! We had not yet broken down and gone to the laundromat yet, but the clothes pile in our hamper was nearing epic proportions. Using our new handy dandy hand cart, We finagled the washer into our apartment and unpacked it. But wait! I'm getting ahead of myself. First, we needed to get rid of the existing machine. It currently sits in our storage area in the garage, waiting to go up to appliance heaven. We just need to do some research about our best options for where to drop it off. Bob unhooked the nozzles and hoses and pulled the washer out of its space. Years of dirt, dust, lint and general grossness greeted us from behind the machine. This was made ten times worse by the soapy, standing water in the drain pipe getting dumped out onto an old towel. I started gagging as soon as I started cleaning the floor up. It. Was. Disgusting. After the floor was sweeped, bleached and mopped, Bob got to work on adding new hoses to the cold and hot water taps. Everything I read suggested that new hoses should be installed when you put in a new system, so we ran to the Ace down the block and bought new tubes. And then we went back to Ace and bought the right tubes. 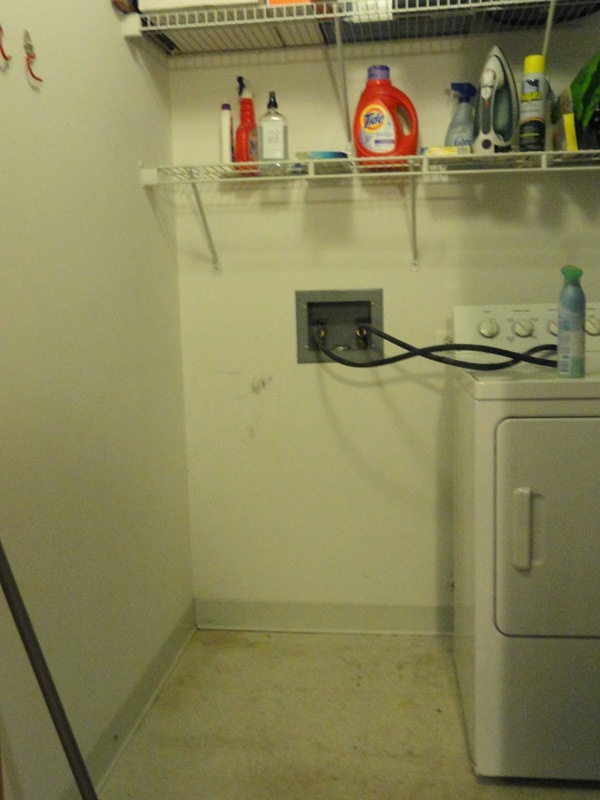 With everything in place, including the drain hose, We pushed the washer into the spot and plugged 'er in. As you can see below, we also got a step ahead by taking down the wire shelving. I said goodbye to most of those empty boxes that were on the second shelf and we found other homes for the rest of it. My habit of keeping boxes from products stems from wanting to have organized moves. When I was able to put the tea kettle back in its original box with each move I was a happy camper. However, this meant I needed to move and store a cardboard tea kettle box five different times. I finally purged. Visions of The Container Store's 30% elfa sale danced in our heads. . .
5 loads of laundry later, we smiled contently knowing we were a third of the way there. 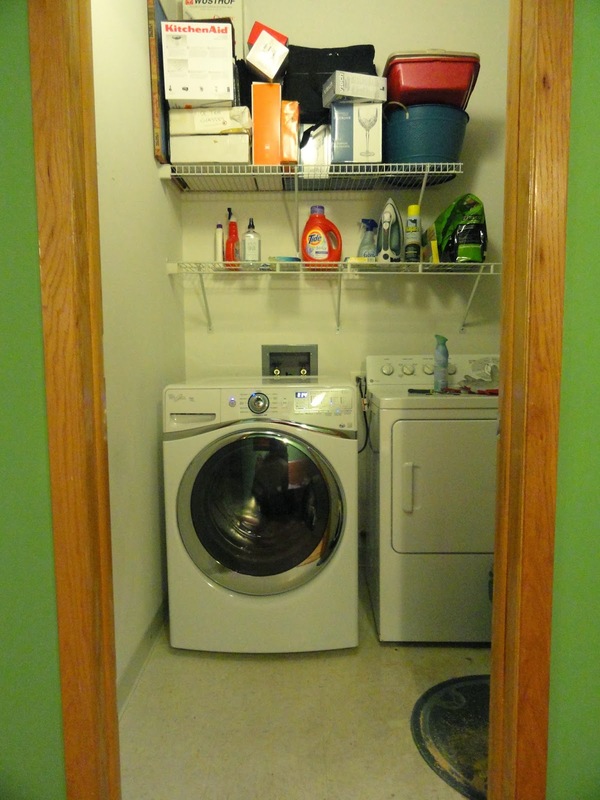 Stay tuned for the how-to's on our dryer installation and shelf styling! 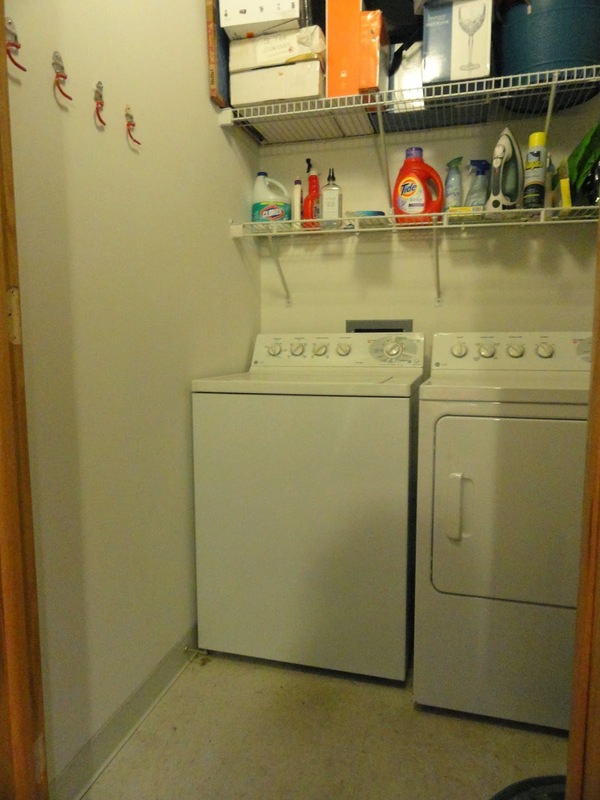 Until then, just know that I have spent at least a full hour since Sunday morning sitting on our entryway bench staring at our new and improved laundry room!